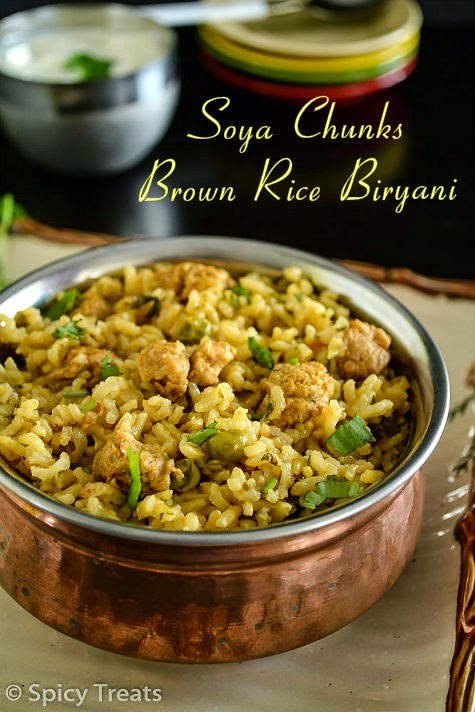 Spicy Treats: Soya Chunks Brown Rice Biryani / Soya Chunks Biryani Using Brown Rice / Brown Rice Biryani Recipe! First i thought of making some Snack or Dosa Recipe using Brown rice but then Yesterday i was craving for some spicy foods and also wanted to make it healthy with simple recipe, so decided to make Brown Rice Biryani for lunch. Only thing i worried was the water ratio, since i usually cook brown rice in open pot with a small fistful of rice and water above 1/2" the rice level. That worked perfectly for me. But for one pot meal i dunno the right measurement and roughly tried with near by 3 times of water and it turned out so good. The rice was cooked perfectly soft, fluffy and at the same time not mushy. I shared it with my friends and they too loved it and appreciated me for the yummy recipe. 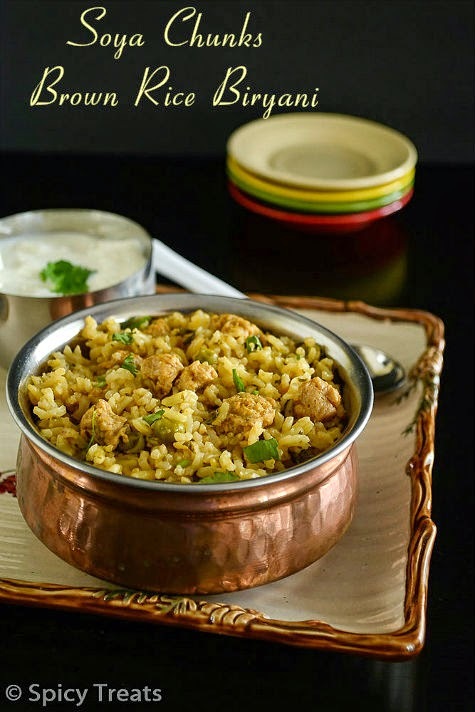 For this Brown Rice Biryani i used soya chunks but you can use mixed veggies or mushroom or even chicken. Now off to the recipe. *Wash and soak Brown Basmati Rice for minimum 2 hours. This helps to get the rice cooked fastly or else it takes more time and will not be soft. Then in a large bowl, add mini soya chunks and warm water leave it for 15 minutes. After that rinse in running water for 3-4 times and squeeze it and keep ready. Then take ginger, garlic, fennel, cilantro, mint leaves in a blender and run it for few seconds without water, make a coarse paste and keep aside. Now heat oil in a pressure pan or cooker, add the tempering ingredients fry well. Then add sliced onion and saute till it turns soft and translucent. And then add coarsely ground ginger-garlic-cilantro paste and saute for a minute. Then add chopped tomato and saute till it turns mushy and add dry powders-chilli, coriander and turmeric powder, stir well. After that add yogurt and saute well for 2 minutes. Now add soya chunks mix well with the masala and add drained brown basmati rice and stir fry with the masala. When it starts boiling turn the heat to medium, stir gently and cover it with lid and cook in medium heat for 1 whistle. After that wait till pressure cools down and once done, open the lid and gently fluff it with fork. That's it...Tasty Soya Chunks Brown Rice Biryani ready. Serve hot with plain yogurt or raita. I usually soak brown rice for minimum 2 hours and i never cooked without soaking. So soaking time is important, i usually soak it around 9 to 9.30 am and i make rice around 11.30 or 12. 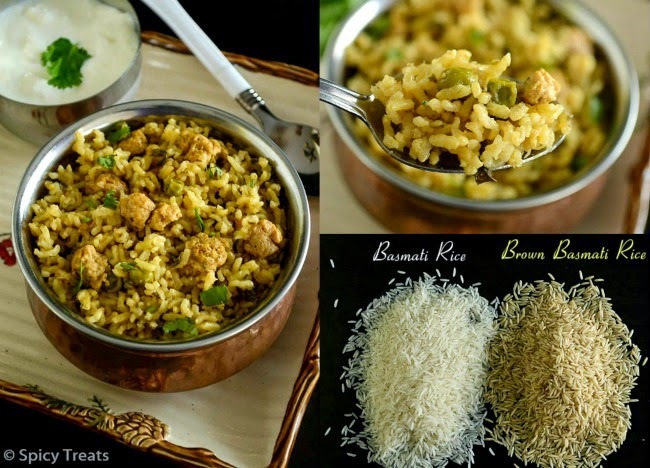 With the same recipe instead of brown rice you can also use regular Basmati Rice. If so, use 1.5 to 2 cups of water. I bought this Brown Basmati Rice from Indian Grocery Store. 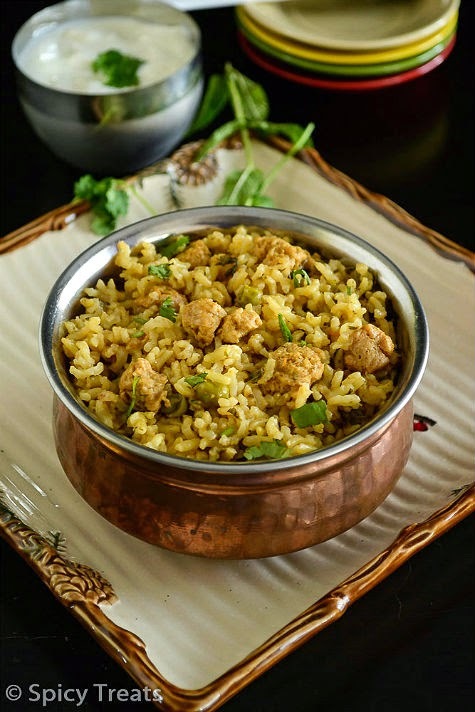 wow such an delicious biryani with soya chunks .. Its making me hungry sangee , such a lovely presentation :) very well explained post :) loving this healthy biryani with brown rice !! 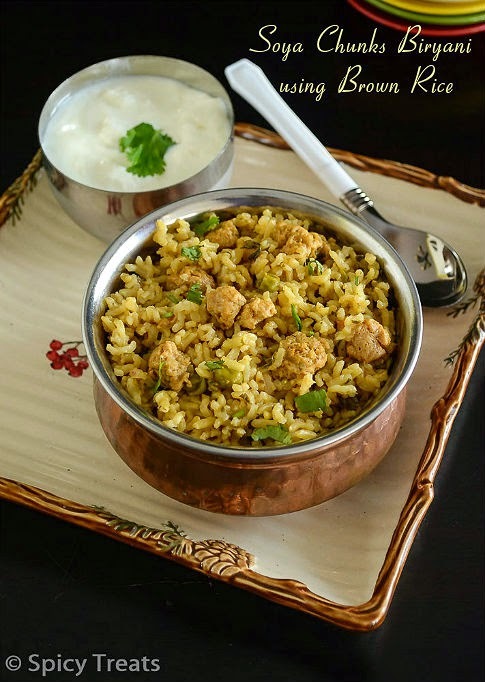 Biriyani with brown rice sounds delicious and healthy too.. Nice pics..
super healthy rice.. I do it very often too.. My kids love brown rice! Such a healthy and very flavourful soyachunks briyani, feel like inviting myself to your place. Just had soya kofta last night for dinner and here your post with rice, can't stop looking at it.